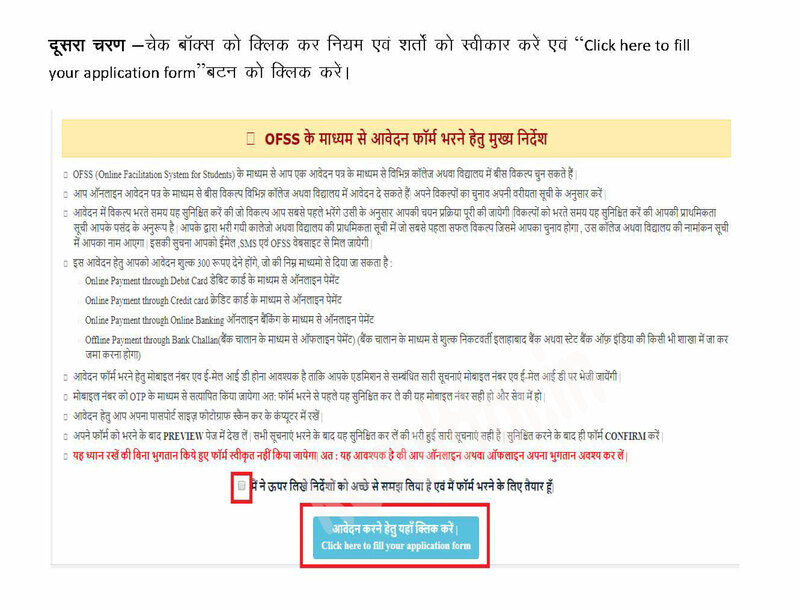 Common Application Form for Class 11th Admission Through BSEB OFSS : You are searching for Bihar Board Class 10+2 Admission, BSEB 11th Admission Intermediate First year, Bihar Board 2019 class 11th Admission Detail, Bihar Board Class 11th Admission Form, OFSS BSEB Admission Form Here is the completed detail and how to apply for Class 11th Admission. From Previous academic year, Bihar School Examination Board do counselling for the admission in the Class 11th. 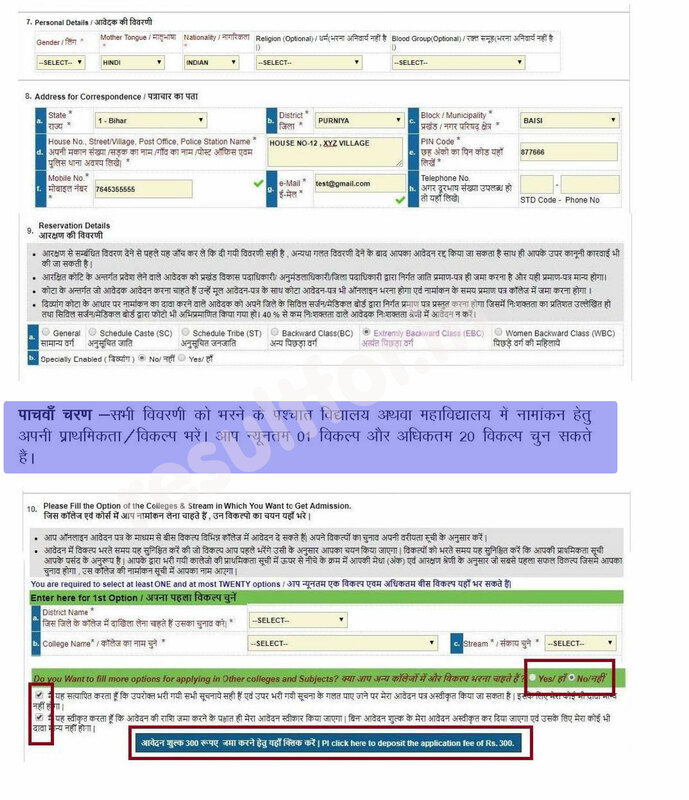 Students who passed this year Bihar Board 10th/Matric Exam 2019 have to fill up BSEB OFSS Common Application Form for admission in the intermediate First year. Through the OFSS Board will be releasing the School wise merit list for the admission. After getting a name in merit list college wise/School wise can get admission. 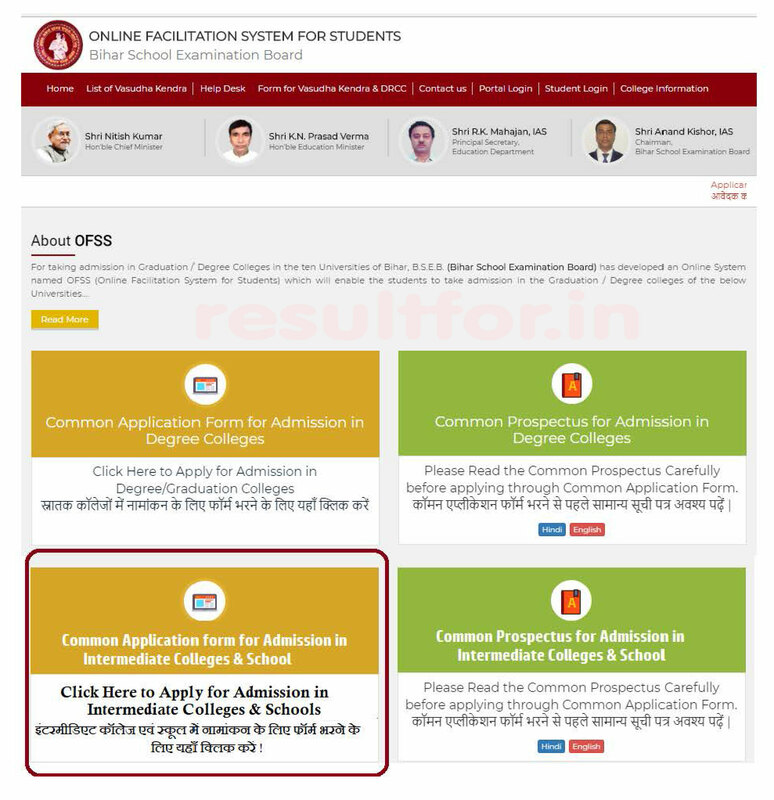 New Updates: Bihar Board soon going the open the inter admission common application form 2019 link for applying to get admission in School College under Bihar Board. Students who are going to take Admission in Intermediate have to make choice of 20 school/college. Students list will be released on the base of Choice of College. Students have suggested after the open the BSEB OFSS link Apply earlier because there is the limit seat for every school/college. Students/Aspirants can visit the cyber café or District Registration and counselling center (DRCC Center) or Vasuda Center for Online Admission procedure. The Bihar Board Admission in 11th will commence from the first week of May 2019. Aspirants can get help about the admission On 0612-2230009 between 10 AM to 5 PM. Aspirants who wish to apply for admission in class 11th have to pay OFSS Common Admission Form INR 300. 11th Admission Form Fill-Up Date: May First Week. 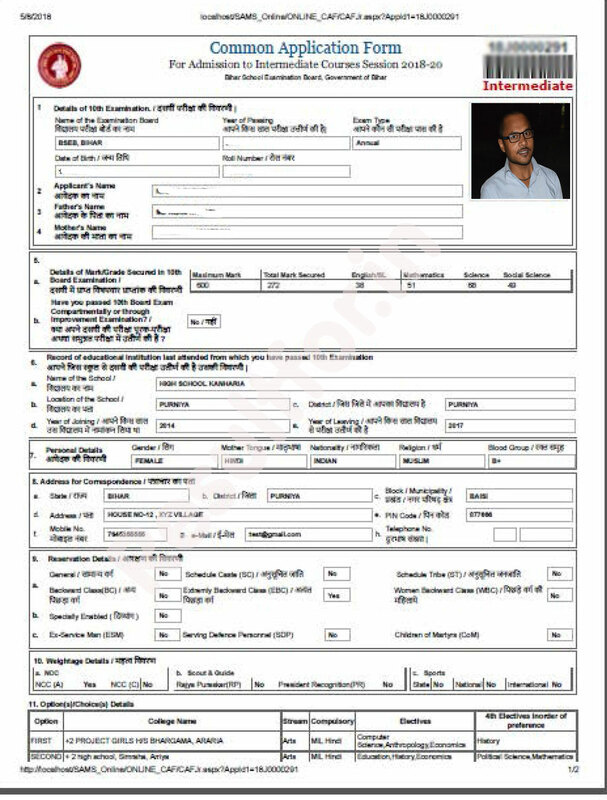 Fill the form and upload photograph and pay CAF Fee online. The link is going to open soon by Bihar School Examination Board, As Board will be open the link we on this web page provide the direct link to apply online. Please Note: Below Stepwise process has given as previous year applied and it is expected that this year will be applied through the same method. If there will any change then we will update. click on the checkbox for accept term and rule. Using detail for which you provided for making payment. 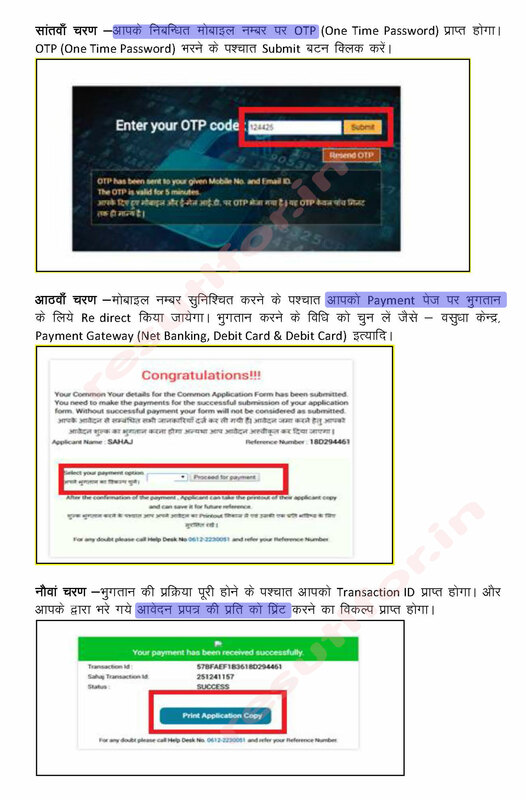 Important: For making payment use SBIePay for easy and instant payment method. SBIePay charges less than Sabpaisa and pays without worry for the later update. 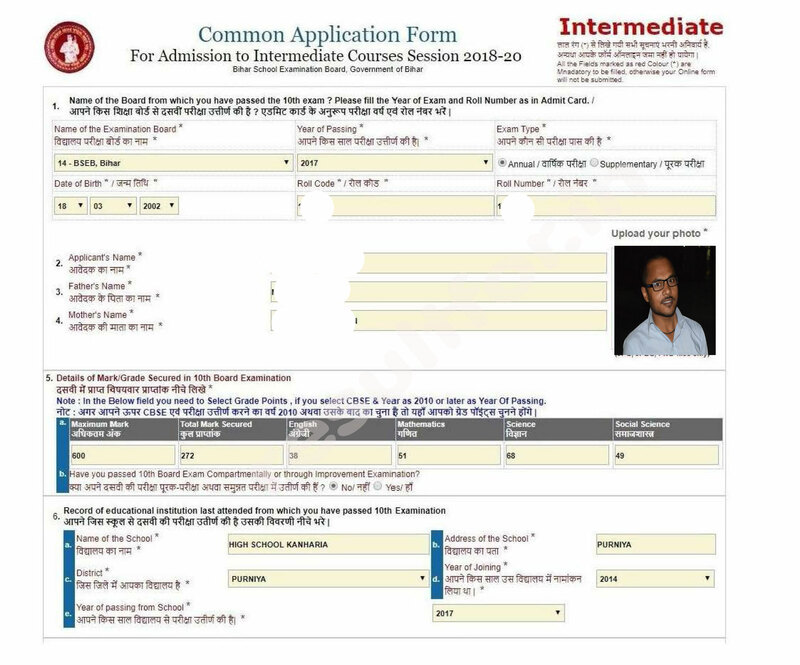 Important for filling of Form: From resultfor.in the website, all are suggested to pay admission counselling fee using SBIePay for easy and safe as well fast payment without failure at less charge. 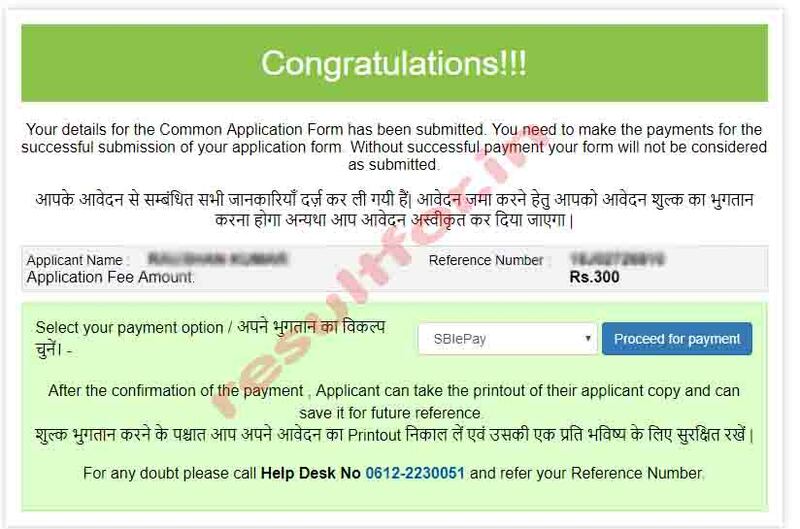 During fill-up Form unable to take print out for Submission form or any other type of suggestion like adding for school/college or correction in the form you can log on by using user id and password which has been sent by BRGOVT during form submission. Sir Mai Sonam kumari mera 10th result incomplete that fir sudhar hua hai Larkin inter me admission nahi ho paya que ke apply server per mera reasult show nahi kar Raha tha .kya kare? jaisaa hi koi notification aayega hum suchit karenge.